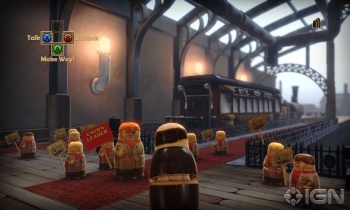 Stacking, Double Fine's game about Russian matryoshka dolls, is coming to the PC. I'll be honest with you: I really don't know anything about Stacking and yes, I had to Google "matryoshka" because I wanted to look smart on the news page. The game apparently sets players up as a tiny Russian nesting doll who jumps into and controls other dolls, using their special abilities to navigate levels, solve puzzles and so forth. Something like that, anyway. The important thing is that after coming out for Xbox 360 and PlayStation 3 back in February, the game is now on its way to the PC. Is it any good? That seems to be a matter of debate; one anonymous commenter said the concept was great but expressed reservations about the actual gameplay, but it did take home the X-Play award for Best Downloadable Game of 2011 a couple nights ago. More to the point, it comes from Double Fine Productions, the guys who did Psychonauts, and when you've got "we made Psychonauts" in your company bio, everything else you do for the rest of time is awesome by default. It's also interesting in light of yesterday's announcement that the previously Xbox 360-exclusive Alan Wake will be released for PCs in early 2012. [Costume Quest, another Double Fine game that came out for the 360 and PS3 in October 2010, was released for PC in October 2011.] It's nice to be able to play these games at the same time as everyone else, if only because it helps alleviate the feeling of being a second-class citizen, but there's also something to be said for delayed releases, which typically come to the table sporting numerous tweaks, upgrades and sometimes even bonus content. I'll take that over a rushed simultaneous release any day. No word on when Stacking for the PC will be out, but we'll keep you posted.